Is it just me, or does pea protein wreak some serious havoc… most dairy-free cheeses have pea protein, and I just can’t handle them. If you’re like me, and want a totally cheese-free, totally dairy-free, totally delicious plate of nachos, I’ve got a treat for you! Nachos are one of those guilty-pleasure foods I really miss. I have yet to find a good dairy free cheese that is tastes great, melts on chips, and doesn't give me a stomach ache. 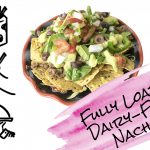 Here is my delicious dairy-free nachos - no cheese necessary! Using your hand, mix the tomatoes, onions, jalapeños, cilantro and lime juice in a large bowl. Gently crush as you mix to release the juices. This salsa tastes best when prepared a few hours before you are ready to eat it (overnight works well). In a food processor mix the avocado, jalapeño, garlic, olive oil, lime juice, lemon juice, and water until you have a smooth creamy mixture. Heat a large pan over medium high heat and add the meat, Break up the meat as cook it. Continue cooking the meat until all the liquid has evaporated, and the meat makes a popping sound in the pan. Create a layer of chips on your plate, add a layer of ground meat and your favorite greens. Dollop the avocado cream sauce around the dish. Top with the pico de gallo, olives, sliced jalapeños and fresh onions.